Roy, R.H. and Richard Foot. 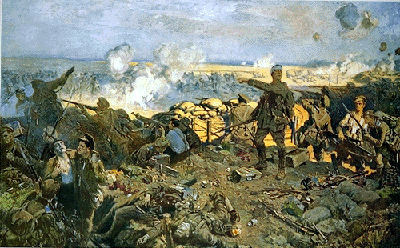 "Canada and the Second Battle of Ypres". The Canadian Encyclopedia, 04 December 2018, Historica Canada. https://www.thecanadianencyclopedia.ca/en/article/battle-of-ypres. Accessed 24 April 2019. At the Second Battle of Ypres, Belgium, 1915. The men of the First Canadian Division — farmers, lumberjacks, lawyers, factory workers, business owners, teachers and doctors — were among the first Canadians to volunteer for service in the war. More than 31,000 men travelled to England as part of the Canadian Expeditionary Force in October 1914, and after a training period in England, arrived in France in February 1915. By this time, the fighting on the Western Front had stabilized into a war of attrition between the great armies of Germany on one side and France, Britain and its empire on the other — dug into a vast system of opposing trenches, running from the North Sea to Switzerland. In April 1915, after a short taste of trench life in a relatively quiet sector of the front, the First Canadian Division was ordered into the Ypres salient — a bulge in the front lines on the Flanders plain, east of the ancient Belgian city of Ypres. The Allies wanted to protect Ypres partly because it offered rail and road links to ports on the coast that the Allies were determined to keep out of German hands. Defending the Belgian people was also a powerful justification for Britain’s role in the war, and abandoning Ypres — the last major Belgian center unoccupied by German forces — would have signalled an important German victory. The salient was a dangerous place for Allied defenders. It was surrounded on three sides by enemy soldiers and artillery. The trench works the Canadians moved into in April were also woefully inadequate — shallow, poorly constructed, and littered with human excrement, pools of water, and the unburied corpses of soldiers killed in previous fighting. Second Battle of Ypres, 1915. Chemical weapons had been outlawed by international treaties before the First World War. In the spring of 1915, however, Germany decided to test a new weapon — chlorine gas — on the Ypres salient. On 22 April 1915, the Germans released more than 160 tonnes of the gas from thousands of canisters arranged along German lines. 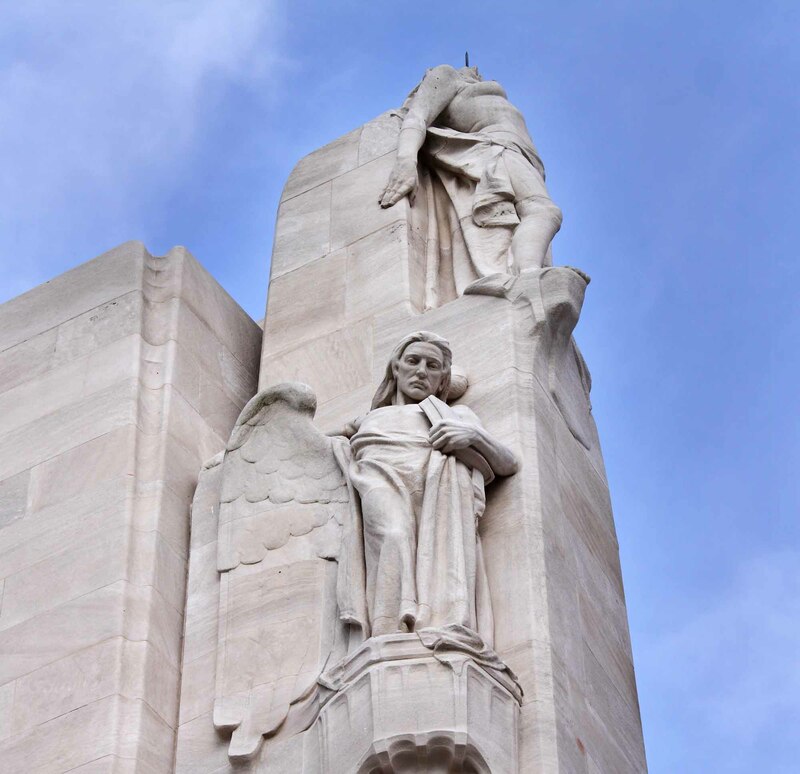 The Canadians, and the French-Algerian troops manning the trenches to their left, watched as a mysterious yellow-green cloud appeared first over no man’s land between the opposing armies, and then drifted with the wind southward over the Allied lines. The heaviest part of the gas cloud hit the Algerians, the chlorine burning their throats and causing their lungs to fill with foam and mucus, effectively drowning the men in their own fluids. The Canadians watched in shock and horror as the suffocating Algerians broke from their lines, many fleeing toward them in panic — leaving a 6 km hole in the front lines on the Canadians’ left flank. As German forces moved from behind the drifting gas cloud toward the now-empty Algerian trenches, Canadian and British battalions — including soldiers suffering from the gas — moved to plug the hole. During hours of desperate fighting that day, with help from isolated groups of French and Algerians, they managed to stop the enemy from encircling the First Canadian Division inside the salient, and from marching on the city of Ypres. Canadian and British forces spent the next several days launching counterattacks and fighting a series of chaotic engagements — at Mauser Ridge, Gravenstafel Ridge and in hand-to-hand combat at Kitchener’s Wood — trying to blunt the German assault and hold the lines outside Ypres. On 24 April 1915, a second gas attack hit the Canadians head-on. None of the troops carried gas masks at this point in the war. Some Canadians fled, and many sought refuge by lying face-down in the crevices of their trenches, where the green, hazy gas cloud, heavier than air, found and killed them. But many others survived by holding urine-soaked cloths and handkerchiefs over their mouths and noses — after being instructed to do so by medical officers who had identified the gas as chlorine. 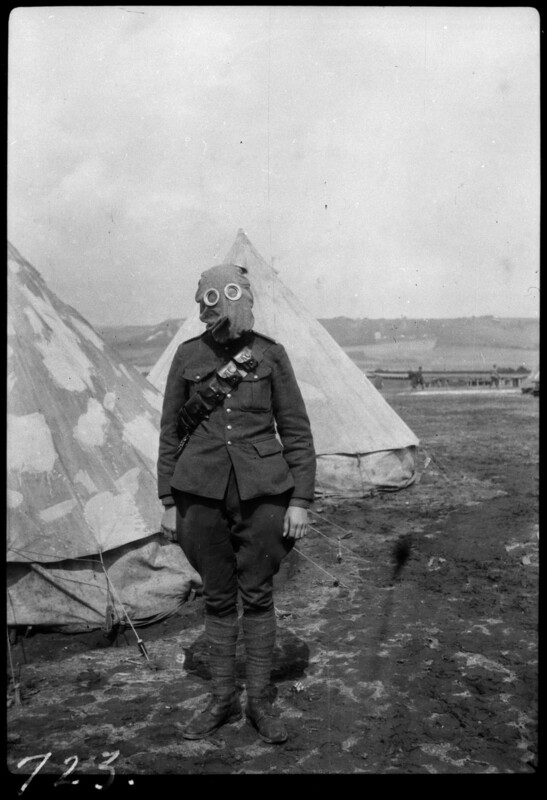 Canadian soldier wearing gas mask, Shorncliffe, Kent, 1917. The 24 April attack opened serious gaps in the Canadian lines and forced the retreat of several battalions. But overall, the battered First Division held the ground outside Ypres, buying time until French and British reinforcements could be brought in. After four days of intense fighting, the Canadians were mostly relieved on 25 April. Dr. Cluny Macpherson, from St. John’s, Newfoundland, is credited with inventing the Phenate Helmet after the Second Battle of Ypres. The Tube Helmet, as it was also known, was a canvas gas mask that was treated with chemicals that protected against chlorine and phosgene gas. The mask was introduced to soldiers across the British army in July 1915. 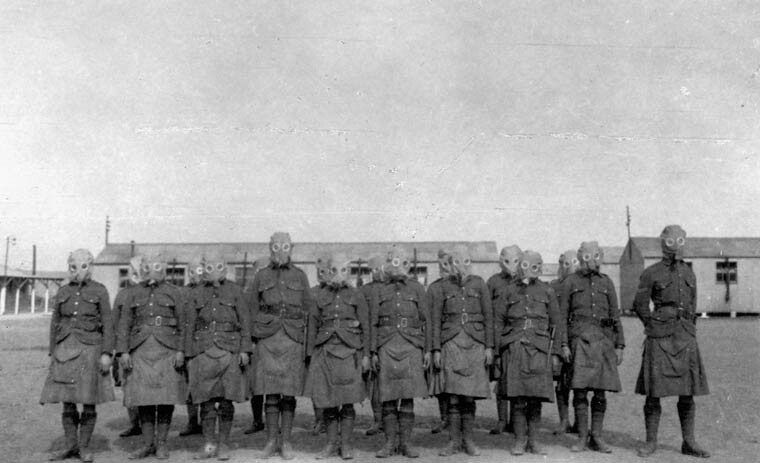 Gas mask drill, 92nd Highlanders, 15 August 1916. 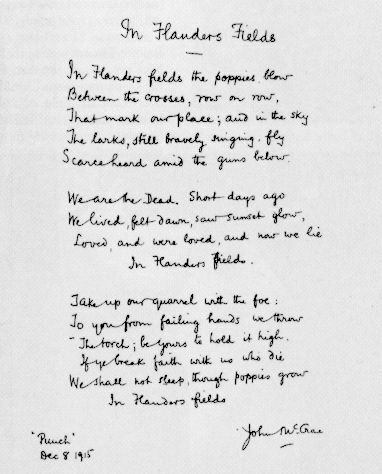 Among those deeply affected by the horror of the fighting was Lieutenant-Colonel John McCrae, a Canadian Army Medical Corps officer, who wrote his famous poem, “ In Flanders Fields,” in the midst of the battle. McCrae’s lungs were damaged by gas during the battle, making his asthma much worse; nevertheless, he tended soldiers at Essex Farm dressing station near Ypres — a bunker with a dirt floor and with light provided only by lanterns and the doorway. The second battle of Ypres continued for another month after the Canadians were relieved, fought largely by British units — and by a battalion of the Princess Patricia’s Canadian Light Infantry — who re-established control of the Ypres salient. For holding the line amid the gas attacks of the first critical four days of the battle, the Canadians were praised for their courage and tenacity, a reputation that would grow as the war continued. The price, however, was high. Overall, British forces lost 59,000 men — dead, wounded or captured — in the month-long battle. More than 6,500 of those casualties were Canadian, including more than 2,000 Canadian dead. Canadian forces would return to the Ypres salient in 1917 for the Battle of Passchendaele — also known as the Third Battle of Ypres — a bloody conflict that resulted in 15,654 Canadian casualties (including over 4,000 killed). Tim Cook, No Place to Run: the Canadian Corps and Gas Warfare in the First World War (1999); Nathan Greenfield, Baptism of Fire: The Second Battle of Ypres and the Forging of Canada, April 1915 (2007); Andrew Iarocci, Shoestring Soldiers: The First Canadian Division at War, 1914-1915 (2008). Canadian War Museum The Canadian War Museum in Ottawa is dedicated to the men and women who served with valour and distinction in Canadas armed services. Their website features a virtual tour of the museum and multimedia online exhibits that depict how Canada met and overcame wartime challenges throughout its history. Edwin Alfred Hervey AldersonA biography of British military officer Edwin Alfred Hervey Alderson from the Dictionary of Canadian Biography Online. The War Amps The War Amps website commemorates Canada's proud military heritage and the sacrifices of Canadian war veterans. 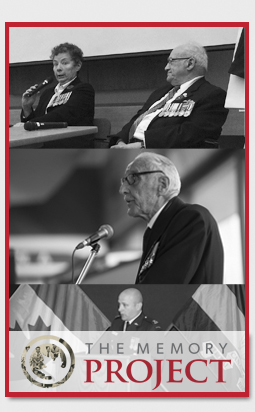 Check out the "Canada's Military Heritage" section for extensive documentation, photographs and veterans accounts of their wartime experiences. Features a special section devoted to the 60th Anniversary of D-Day, army newsreels, and more. Valour Road View a brief video about three Canadian soldiers from Winnipeg who earned the Victoria Cross in the First World War. A Heritage Minute from Historica Canada. See also related lesson plans. Trench Warfare In 1915A brief analysis of the effectiveness of Allied military tactics at the Second Battle of Ypres. From Legion Magazine.